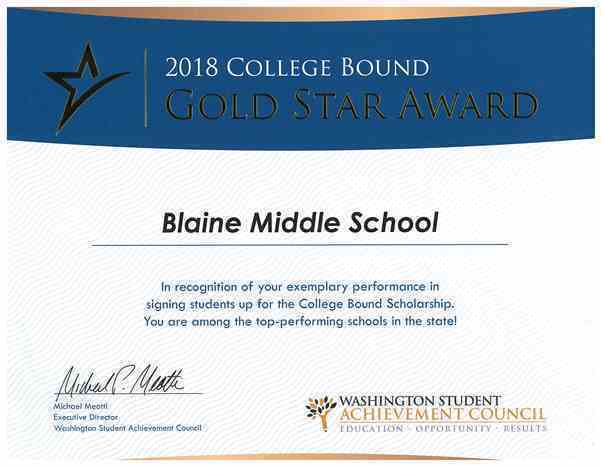 Blaine Middle School recently received a Gold Star Award from the Washington Student Achievement Council for signing up 85% of eligible students in the Class of 2022 for College Bound Scholarships. Along with 287 schools across the State of Washington, Blaine Middle School was recognized by Governor Jay Inslee for exceeding the state sign-up rate of 70 percent. Over 30,000 of last year’s eighth graders signed up for the College Bound Scholarship. You can find the list of Gold Star schools and districts, along with district sign-up rates, on the Washington Student Achievement Council’s website. The College Bound program provides state financial aid to low-income students who may not consider college a possibility due to the cost. Students who sign up for the scholarship in middle school graduate from high school and enroll in college at higher rates than their low-income peers. The first cohort of College Bound students graduated from high school in 2012. Since then, the four-year high school graduation rate for these students has consistently been similar to the statewide average, and over 10 percentage points higher than for low-income students who were eligible, but didn’t sign up. Eligible students must sign up in middle school, by the end of their eighth grade year, to receive this early commitment of state funding. In combination with other state aid, the scholarship covers tuition at public college rates. To receive the scholarship, students must enroll in an eligible college within one year of high school graduation.